The Navy SEAL killed in northern Iraq Tuesday was part of a reaction force sent to rescue a small team of American advisers who had joined in the fight to help Kurdish Peshmerga forces push back a large surprise ISIS assault to take the small town of Tel Skuf, north of Mosul. Special Warfare Operator 1st Class Charles Keating IV, 31, of San Diego, was identified on Tuesday evening as the SEAL killed in the attack launched by 125 ISIS fighters. Army Col. Steve Warren, the U.S. military spokesman in Baghdad, told Pentagon reporters today that the attack was the largest such ISIS assault in recent months. Thirty-one airstrikes called in to help repel the attack killed 58 ISIS fighters and destroyed more than 20 vehicles and trucks. Warren labeled Tuesday's fight as one of the most complex battlefield operations launched by ISIS since last December. Warren said the attack on Tel Skuf fits the ISIS pattern of launching high-profile attacks to gain attention in the wake of a series of battlefield losses, as has happened recently with the Iraqi military pushing ISIS out of the towns of Hit, Bashir and Makhmur. 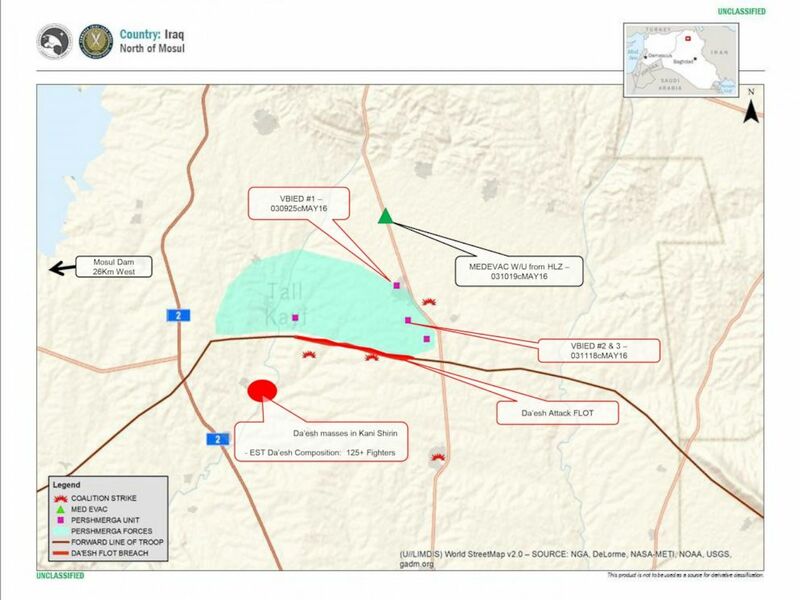 A map provided by the Department of Defense details the ISIS (Daesh) assault on Tel Skuf. A force of 125 ISIS fighters crossed the Peshmerga’s front lines (FLOT) on Tuesday, May 3, 2016, assaulting the town. A small team of American advisers was on a mission to meet with local Kurdish Peshmerga forces at Tel Skuf, a village located just two miles north of the frontlines with ISIS. At 7:30 a.m. local time, a force of 125 ISIS fighters in more than 20 vehicles crossed the Kurdish frontlines and headed towards Tel Skuf. They used two bulldozers to get past a checkpoint and then used a truck bomb to attack the Peshmerga outpost that the American advisers were visiting. Twenty minutes after the ISIS forces had crossed the frontline, the Americans began fighting alongside the Pesh forces to repel the attack. They also called for a Quick Reaction Force (QRF) that was standing by to come and take them away from the fighting. “There was a big fight," said Warren. "They couldn't get away. So the QRF came to help ensure that they were able to get away." Navy SEAL Charlie Keating was a member of the quick reaction force that responded. He was struck by direct fire at 9:32 a.m. Though he was medevaced to a medical facility in Erbil, he did not survive his wounds. There were no other American injuries, and it is unclear how many Pesh forces were injured. In another sign of how violent the firefight was, both Black Hawk medevac helicopters that arrived to evacuate Keating were damaged by small arms fire. Eleven American fighters and bombers, including F-15s, F-16s, A-10s, and B-52s, as well as two drones, were quickly scrambled to push back the ISIS attack. Altogether, 31 airstrikes killed 58 ISIS fighters and destroyed 20 vehicles, two more truck bombs, three mortars, and a bulldozer. The Americans were engaged in the fighting for a few hours, but the battle between Kurdish and ISIS forces continued until 9:30 p.m. The 3,670 U.S. troops currently inside Iraq are there in what is called a training, advise and assist mission. But less than a thousand are actually involved in the training, advising and assistance portion of the mission. Warren said the actual number of American advisers who work with Iraqi military and Kurdish forces numbers several hundred. "It's a handful of teams that go and advise and assist," said Warren. Additional personnel involved in training and equipment brings that number to less than 1,000. The majority of American troops in Iraq are there to provide protection, security, staffing and logistics support to the trainers and advisers. President Obama has recently authorized a troop cap of 4,087 for American forces in Iraq, though there are probably an additional 1,000 not part of the official count because they are on temporary assignments in Iraq lasting less than 120 days. The small teams of American advisers operate from higher Iraq and Kurdish headquarters, providing commanders with help in military planning or logistical support. Since the start of the mission two years ago, they have moved about freely to interact with commanders in the field as long as they remain well behind frontlines. In the case of the firefight at Tel Skuf, the advisers happened to be at an outpost behind the frontlines that had been targeted by the large ISIS force. Col. Warren told reporters that every visit by American advisers with local forces in the field involves a lot of behind-the-scenes coordination and planning to ensure their safety. Each adviser visit has a Quick Reaction Force dedicated to it that is placed at a distance where they can arrive quickly to extract the advisers if they come under attack. Each mission also has dedicated medevac teams for emergency medical treatment and overhead drones that provide surveillance of the area before each visit. “So when the fire erupted, the Quick Reaction Force quickly reacted and came to the battle and provided the additional firepower and maneuver that was required to extract the remainder of our personnel," said Warren.